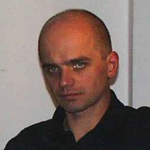 Born in 1965 in Częstochowa. Studies at the Academy of Fine Arts. Graduated in 1993 under tutorage of Prof Stefan Gierowski. Instead of painting people he portrays interiors, facades, libraries filled upto the ceiling with books and shop windows. 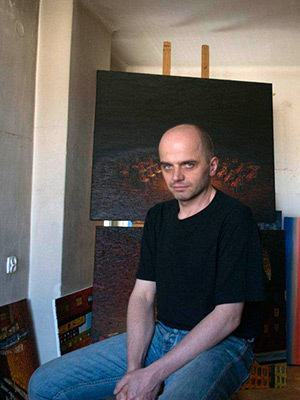 His paintings are dark and full of tension even though they do not depict dramatic scenes. They are made with full of texture thickly laid paint, which creates almost a jewellery-like tissue. The interiors on his canvases are not just ordinary rooms but gloomy cells and theatrical props emanating void. There is something in them that reminds one of the last paintings of van Gogh. Patrzyk is definitely one of the contemporary continuators of the expressionism trend in art. His expressionism is unusual: introvert, intimate and focused.